You will not find this country on any map and, according to international law, it does not exist. But the small, separatist state of Trans-Dniester is celebrating 15 years of self-proclaimed independence. Sandwiched between Ukraine and Moldova, it broke away from the Soviet Union just before the USSR collapsed. 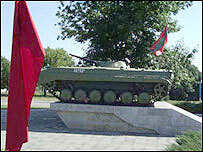 Officially, Trans-Dniester is part of Moldova, but a bloody civil war in the early 1990s resulted in an uneasy peace. Igor Rolotovsky returns to the place where he fought for Trans-Dniester independence. The medals on his military uniform clink together as we walk across the old battlefield, now waste ground. Igor points out where his tank was blown up, near the Moldovan border. 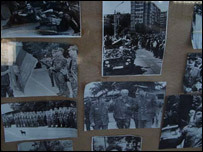 Hundreds of people on both sides were killed in the conflict. "People suffered a lot back then; they were living under permanent bombardment," Igor says. "When our troops came to this place here we found it was all destroyed, there were dead bodies everywhere. I can't tell you how awful it was, all that blood." This breakaway republic, home to just over half a million people, is now guarded by Russian peacekeepers. A couple of hours drive from the capital, along a dusty track, tethered goats nibble at the grass outside small houses. Here in the heart of the Trans-Dniester countryside there is an army base which stores much of the Soviet munitions. The separatist state has one of the largest stockpiles of arms in Europe. Hundreds of thousands of tonnes of weapons were left behind by the Red Army. Without international controls and a porous border, Trans-Dniester has become a smugglers paradise, according to political analyst Oazu Nantoi, from the Moldova-based Institute of Public Policy. "During the last 15 years, the Trans-Dniester area became a black hole, a centre for a network of international organised crime," Mr Nantoi claims. "There is smuggling of alcohol, tobacco, human beings, drugs and it's a centre for illegal arms trafficking." The European Union is currently monitoring the borders of Trans-Dniester with Ukraine because it is troubled by the situation. But the Trans-Dniester President Igor Smirnov told me that there was no smuggling from here. "I respect the concerns of the West, but these fears have been created by the lies told by the Moldovan security services." On the streets of Tiraspol, capital of Trans-Dniester, most people speak Russian, while in Moldova the main language is Romanian. There are many signs here in the city centre that the Soviet legacy lives on. 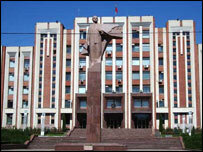 A giant statue of Lenin towers outside the president's office. Across the road flutters a green-and-red Trans-Dniester flag, bearing the hammer and sickle of the USSR. Trans-Dniester money and passports also bear Soviet symbols. A few minutes' walk away is the run-down office of Alexander Radchenko, an opposition leader and chief editor of an opposition newspaper. He says life is hard in this breakaway region - his office has been the target of two arson attacks and there is offensive graffiti on the front door. "It's very sad. We did hope that we would get freedom and democracy and that people would be able to live and work happily. But now living standards are the lowest in Europe while the unemployment here is the highest," Mr Radchenko says. "And it also makes me upset that the authorities are so totalitarian." Trans-Dniester is due to hold parliamentary elections in December as part of attempts to bring peace to the region. But the state is concerned there may be mass protests like the "orange revolution" in neighbouring Ukraine, which led to the opposition leader coming to power. A youth group called Breakthrough, which supports the president, has set up what it calls the "Che Guevara High School". It holds classes for teenagers in a grim hotel in the capital. Here, youngsters are taught patriotic values. It is hoped this will prevent a revolution happening in Trans-Dniester. "We want to live here, we want to fight for our interests and we want to be a recognised republic, Trans-Dniester Republic," says Elena Arshinova, one of the Breakthrough leaders. "We don't want to be with Moldova, we don't want to be with the USA. We want to present our Trans-Dniester interests, on our territory." But there is little chance of Trans-Dniester getting international recognition until there is a peace settlement - and that is a long way off.